The sister ship of the Dawn and Sea, the Sun Princess is loaded with amenities that will make your trip both comfortable and luxurious! Princess cruises are known for their phenomenal personal service, so you know that your trip will be catered to your every whim! 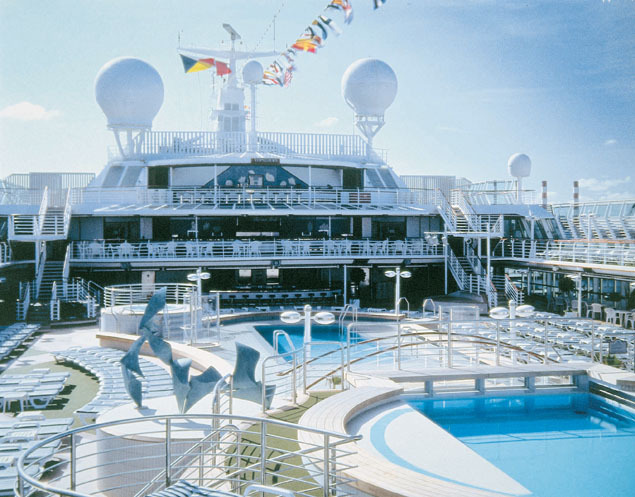 This ship has 400 balcony staterooms, three pools, and scrumptious dining - not to mention an amazing spa! So get ready for the journey of your dreams, and book a cruise on the Sun Princess! Splash around at the Riviera Pool, and enjoy the two hot tubs or just relax in the sun! The Lotus Spa® Pool also has two hot tubs to help you melt away your stress. Head to the spa for a refreshing, relaxing session - get a massage, a hot stone rub, and more! There is also a gym and fitness area where you can work out, a sports court for basketball and volleyball, shuffleboard - and the ship even has virtual golf simulators so you can practice your swing! Head over to the unique designer boutiques, and enjoy duty-free shopping for clothes and gifts! 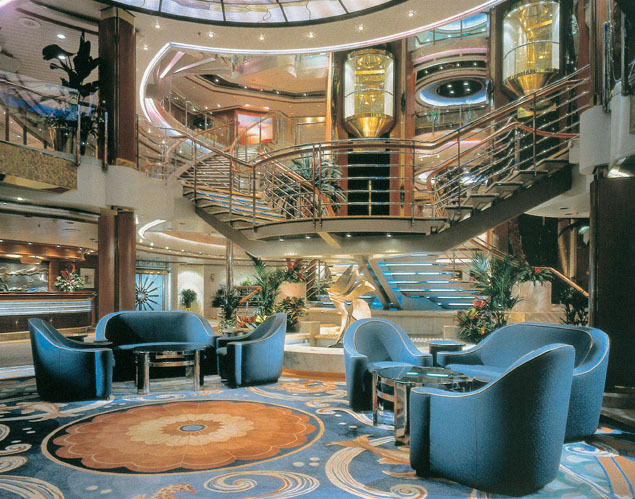 The ship has an art collection that features an auction, so you can take your favorite art home with you! There's a library, writing room, and a 24-hour Internet Café with wireless access. The ScholarShip@Sea® program makes learning fun again - you can attend a great seminar and learn to cook, learn to dance, and more! 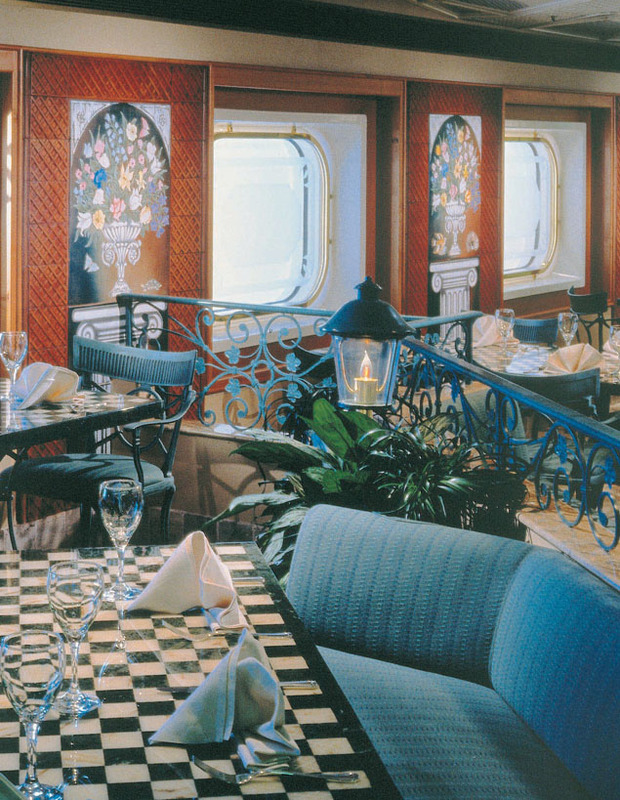 Dining on the Sun Princess is a delectable experience - the chefs prepare the finest cuisine you'll ever taste! This culinary art is served with several options. You can enjoy traditional dining, at the same time and location each day, in the Regency Dining Room. Specialty dining options include the Ultimate Balcony Dining program, where your food is served to you with a breathtaking view! The Sterling Steakhouse is a great spot to enjoy a filet mignon! 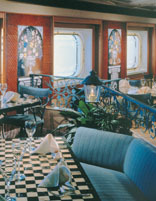 The ship also has a wine bar, a patisserie, Verdi's Pizza, the Trident Grill for burgers and hot dogs, and you can even have afternoon tea! The Horizon Court is open 24-hours a day, and you can also get room service delivered to your stateroom 24-hours as well! Enjoy that midnight snack from the comfort of your quarters! The Sun Princess has entertainment for everyone to enjoy! With theater productions, movies, lounge acts and comedians, you know you're in for a treat! The Grand Casino has all of your favorite games from Vegas, including poker, roulette and slots! Check out a feature-length film or a Broadway-style performance at the Princess Theater, or at the Vista Show Lounge! 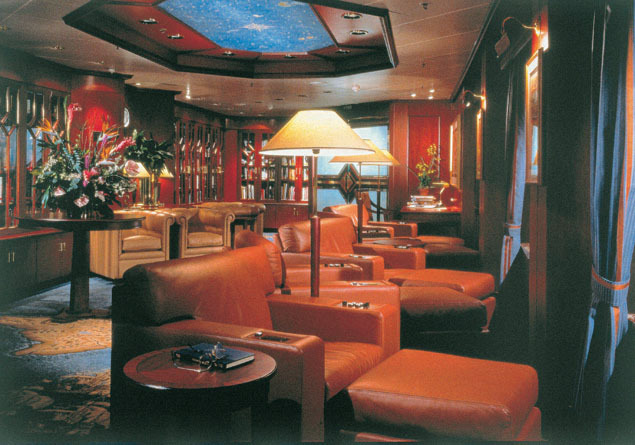 For a more relaxing, laidback and cozy atmosphere that you can enjoy, have a cocktail with your friends at the Wheelhouse Bar, or at the Atrium Lounge and Bar. Shooting Stars and Rendez-Vous are two more great hotspots!